The Otago Future Fuels workshop, OFF, chaired by Prof Sally Brooker, will be hosted by the University of Otago from Thursday 7 to Friday 8 February 2019. Registration has closed (places were limited!). The registration desk will be open from 8am Thursday 7th Feb in the Mellor (Chemistry) Foyer (see red M on maps below). All delegates are encouraged to present a poster (portrait A0 size posters can be put up from 8am on Thursday 7 Feb). Student speakers have been selected from abstracts submitted (they should still present posters too). Opening remarks and house keeping will start in Mellor lecture theatre 2.02 (at the top of the stairs in the Mellor foyer) at 8.50am, followed by the first tutorial at 9am. OFF has been timed to fit in with the MacDiarmid Institute for Advanced Materials and Nanotechnology international conference, AMN9, in Wellington starting Sunday afternoon 10 February. The trip from Dunedin to Wellington is a short flight (make sure its direct!) which can easily be done on one of the days that weekend, perhaps after a yummy breakfast at the Dunedin Farmers Market at the Railway Station on the Saturday morning (from about 8am). The workshop will feature tutorials by experts in the field, as well as student talks (selected from the submitted poster abstracts) and posters. There will be a prize for the best student talk, and there will be poster prizes too. Some delegates are housed at Studholme Residential College (for Wed-Fri nights). This college is a 5-10 min walk to the University: see the red marker on the maps below. 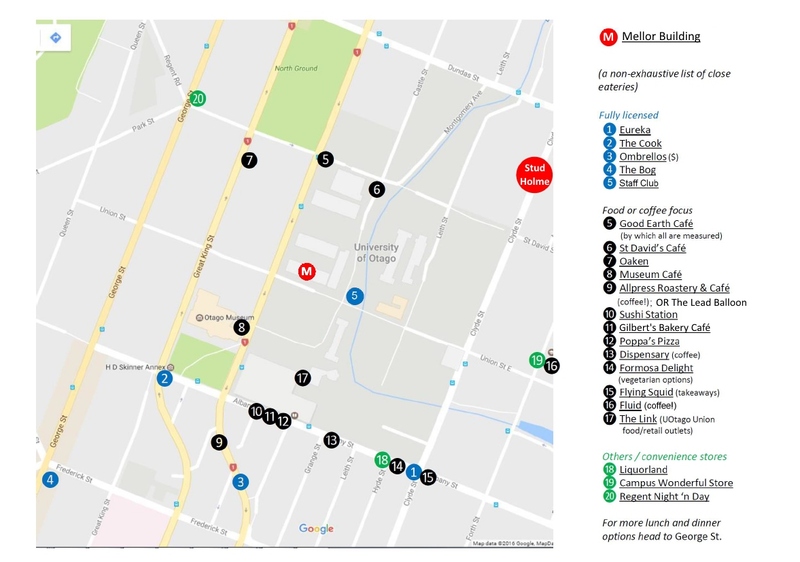 Registration starts at 8AM in the main foyer of the Chemistry Department (red M on the map; ground floor between Science II and Mellor buildings). All tutorials will be upstairs in the Mellor Lecture Theatre. 3D Campus Map (note that North is pointing DOWN in this map, not up as is standard practise!) – showing the handy footpath/steps down the hill from Studholme to the road and campus, and the location of the entrance to the Chemistry foyer/Mellor (red M on map). The Mellor lecture theatre 2.02 is up the foyer stairs to the second floor of Mellor (for the tutorials/lectures). Morning and afternoon tea, as well as lunch, will be provided; and the conference dinner (Thursday night) is also included in the registration, so we look forward to seeing you all there. 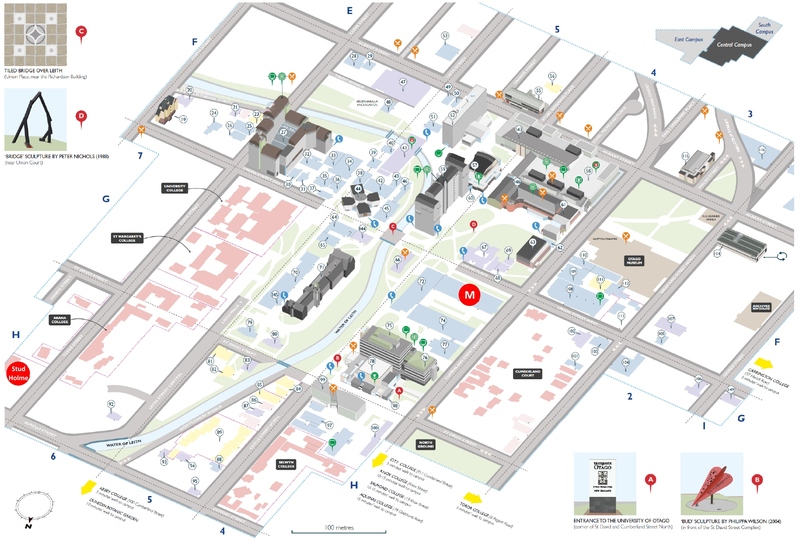 2D Campus Map (with North pointing up as is usual on maps, so this is opposite to the 3D map!) – showing not only Studhulme and the Mellor building but also a range of (not all!) nearby food outlets. 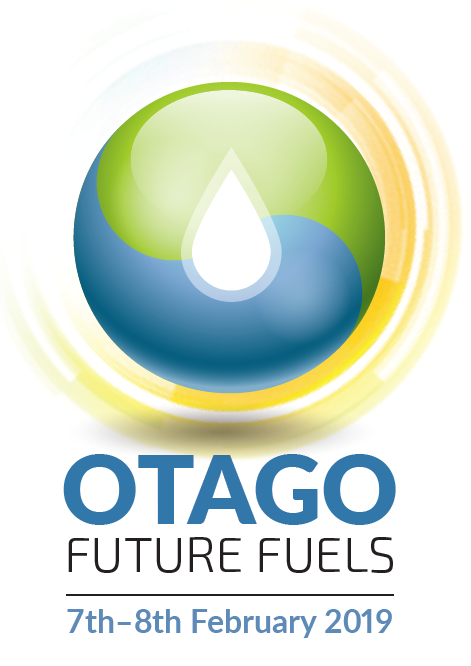 The aim of this OFF conference is to bring together researchers, especially from New Zealand, who have an interest in solar/future fuels. Whether you’re an active researcher in an established group, or an honours student with an interest in this field, OFF will provide a basic education in the field, from the fundamentals through to case studies of published systems by way of measurement techniques and theoretical modelling. We aim to keep the cost as low as possible for attendees by holding this OFF workshop at a convenient time (immediately before AMN9) and keeping the organisation cheap and cheerful. 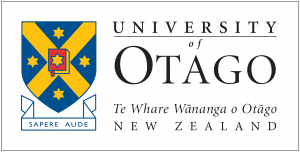 The University of Otago, New Zealand’s first University, has an international reputation for research excellence. 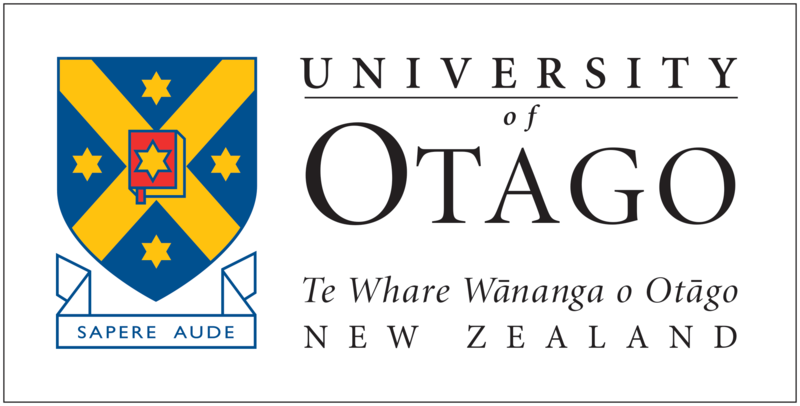 It is New Zealand’s most research intensive university and a top-ranked university for research quality. It celebrates its 150th anniversary in 2019. Dunedin is renowned for its spectacular beauty and is also a gateway to the beautiful scenery of Central Otago and the Catlins. Majestic Victorian and Edwardian architecture, a proximity to an abundance of wildlife and a healthy youth culture make for an exciting and fascinating visit. Early February is a great time to see Yellow Eyed Penguin and albatross chicks on Otago Peninsula, and if you like this sort of thing then a visit to Orokonui Eco-sanctuary is also a must. We look forward to seeing you in Dunedin in February 2019!